We do not price our work by STITCH COUNT. 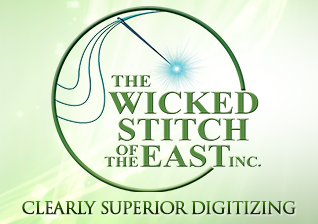 We believe that stitch count pricing is an antiquated way of pricing. We price by the level of complexity of a design. Complexity translates into the amount of detail and the amount of lettering that needs to be punched in a design. On average, we have found that we are about 40% less than our competition with our level of experience and training. We do offer "level-pricing" for high volume. Fax/E-mail or send us your designs to quote, you will be pleasantly surprised by the low price. Rush Service - We offer 24 and 48 hour turnaround times. Call for current pricing on this service. Jacket Back & Full Front embroidery - by quote only. Please remember to provide the best artwork possible. Your design will only be as good as the artwork that you provide. You can fax us artwork to our 24-hour fax line, e-mail files, use our on-line quote form, or ship. GRAPHIC FILES We prefer to work with VECTOR images, .AI, .EPS or .PSD. Other files can be sent in the following formats: .BMP, .GIF, .JPG, or .TIFF. We can read other files as well - just ask us. We prefer not to use Word Documents or .pdf files as artwork. We will suggest necessary changes to artwork (if needed) when we quote on your artwork. Suggested changes usually include copy that is too small to be legible and excessive detail that will not work in embroidery. If you insist that a design is punched in manner that is inconsistent with our suggestions and the design does not work, you will be charged for the edit or re-punch of the design. Why repunch? We will look at your problem designs (FREE of charge) and see if we can edit them without costly repunching. Design errors not reported within 5 working days of receipt of design will be subject to editing fees. We can convert most commercial and home embroidery formats. We do not convert paper tapes. Our payment terms are VISA/MASTERCARD, prepayment or NET 10 days. (with prior approved credit).